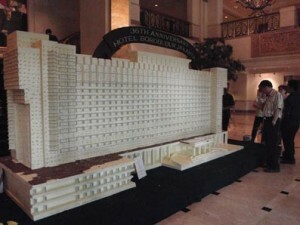 Tuesday (23/3) was Borobudur Hotel’s 36th birthday. They offer cheap set menu – IDR 36k++ at all restaurants – and 36% discount at its pastry shop, Gourmet. The lunch hour was 11.30-14.30, I came at 13.00 and the queue list at all restaurants were already closed. Tens of customers who managed to get into the list had to wait about 1-2 hours. The traffic nearby the hotel was jammed in excess of the brouhaha. The first pics I took were of people who, unfortunately, didn’t get a chance to taste the set menu, but tried their luck at the Gourmet. 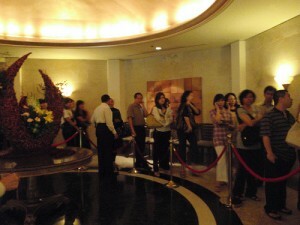 Yes, they still had to queue anyway. And this last one is the hotel’s miniature, built of yummy chocolate.